There are four C’s jewellers use when grading gemstones…and they tell you everything you need to know about moissanite to achieve the fifth C – which is Confidence. The quality and enduring value of moissanite jewellery can be expressed in those 5C’s and every Charles & Colvard Created Moissanite® gem is strictly examined by our experienced Gemological Institute of America Graduate Gemologists. The past two decades have seen ongoing research and development aimed at expanding the colour range of Charles & Colvard Created Moissanite® to meet market demand. Now in near-colourless Charles & Colvard Forever One GHI which is visibly whiter than the original Forever Classic range to the crowning achievement in gem innovation is the Charles & Colvard Forever One DEF an unfailingly pure, white colourless gem in the premium DEF range. 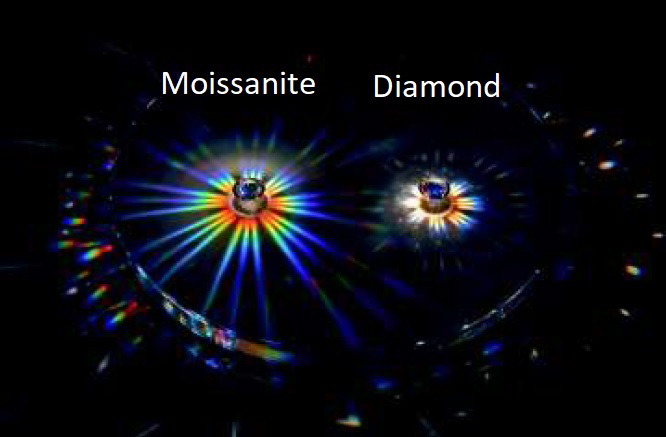 Moissanite is visually proportionate to typical diamond carat weights but is approximately 10% lighter. Most jewellers find it easier to sell moissanite by size rather than weight. A 6.5mm round brilliant natural diamond would have a carat weight of approximately 1.0 compared to a moissanite of the same dimension (6.5mm) which has a carat weight of approximately 0.88. Simply put, to the eye they appear to be the same size, although the weight of the two stones may be slightly different. Like other gems, large sizes of moissanite are rare. However, the premium for large sizes is much less, making moissanite a particularly good choice for bold jewellery designs. Known to many as “The World’s Most Brilliant Gem®”, with unsurpassed fire and brilliance, this unique created gemstone is the ultimate in affordable luxury. All Charles & Colvard® created gemstones are backed by a Charles & Colvard Certificate of Authenticity and Limited Lifetime Warranty. This winning combination delivers the quality and confidence you deserve while empowering you to express your keen sense of style and great taste. Charles & Colvard® ensures that your moissanite gemstone is an original of exceptional quality & craftsmanship. Grown in an American laboratory, Charles & Colvard Created Moissanite® is a responsible alternative to mined gems, providing jobs without damaging the environment. Charles & Colvard Created Moissanite’s durability means that its beauty and value will endure forever. Moissanite is one of the hardest minerals on earth and is extremely resistant to scratching, abrasion, breaking, or chipping. Charles & Colvard’s promise to you is that its fire and brilliance will last forever.